Firstly, Dear Reader, I must offer a humble apology for the considerable dearth of offerings from this nook-shotten Isle. I can offer very little reason for this other than the strumpet fortune has been more than a little dictatorial with her demands upon my pocket. Resultantly, outings to the spaces where disbelief is to be suspended have been somewhat curtailed. Thus settled, it was time again to wrestle with the ‘fierce dispute / Betwixt damnation and impassion'd clay’ and steel myself to ‘burn through’ the ‘bitter-sweet of this Shakespearean fruit.’ Lear always has this effect – a difficult viewing experience often – tortuous, violent, unflinching in its betrayal of human brutality and suffering. It assaults – it demands to be watched. How did this production stand up? Well as with Lear so often, the focus falls chiefly on the actor playing the eponymous tragedian. Greg Hicks’ (see my enthusiasm for his performance as Leontes last summer) first scenes were not his strongest. His ‘dragon’ was more smoke than flame and there were one or two moments that did not quite ring true. However he came into his own after his descent into madness. As he staggered off the stage, clad only in his shabby undies, arms held aloft with Poor Tom’s he looked old and frail. At times he was apparently insensible of his surroundings, disoriented and frightened – like one lost to the ravages of Alzheimer’s. His gradual recognition of Cordelia was gentle and poignant, whilst his final entrance with Cordelia was full of pathos. To achieve the full tragedy of the character the decline from King should have been a little stronger – what we saw was the sad, human tragedy of a man; which is not to diminish a fine performance. This was a fairly strong ensemble piece. The excellent Charles Aitkin made a very compelling Edgar – such a change as often Edgar is the damp squib of a production whilst the actor playing Edmund steals scenes with his bravado and cavalier predatorial nature. However in this production Tunji Kasim as Edmund put in a fair performance but for such a peach of a character it was something of an opportunity missed. Aitkin however has energy and a physicality which created a very strong presence. His scenes as Poor Tom were fearless and tinged with a satisfying combination of the comic and the tender. Honourable mention must go to Geoffrey Freshwater (Freshy to some of the old Histories crowd) who was a rich and pathos-filled Gloucester. Distraught by Edgar’s apparent treachery then genuinely stricken by Edmund’s, his scene with Lear moved me perhaps more than many other scenes. His interaction with Edgar after the blinding was also particularly affecting, and as Edgar ‘trifled’ with his aged father’s despair there was a gentleness to the scenes which made it overflow with the painful inevitability that poor old Gloucester does not survive the final reunion with his loyal son. Kelly Hunter (who made a fine Hermione last year) put in a strong performance as Goneril – less outright wicked than her sister but increasingly fraught mentally as the play continued, perhaps mirroring the surround chaos and fall of the play-world. 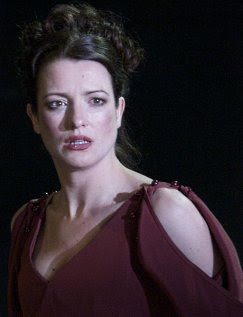 Samantha Young made a decent job of Cordelia (though to be fair she is a tough character to make interesting).She managed to imbue Cordelia with a degree of strength which is quite rare. It was pleasing to see this young actress present a stronger performance than her disappointing Perdita last summer. The design of the production was nothing revolutionary but nonetheless effective. It began with the bedraggled figure of Edgar staring woefully at the empty throne – a simple, rough, rustic wooden seat covered with a tattered rag. Edgar then pulls off the ragged cloth and we are presented with the Lear story in retrospect. As with Nunn’s Production for the RSC, parts of the scenery, of the ‘foundations’ of the play world began to break, shatter and fracture as the story continued thus reflecting the descent into personal and political pandemonium. The costumes themselves caused some amount of confusion with me and my theatrical companions – there were a mixture of styles and periods presented. As the conflict developed First World War soldiers appeared across stage, whereas earlier men had been dressed in largely mediaeval garb. Lear’s followers by contrast were dressed in skins, furs and roughly clad thereby showing their link to an older time which was fast made redundant with Lear’s renunciation of political power. However I am not sure that the jumble of costumes worked entirely, as it did not seem to present a unified vision. Maybe I would need to see it again. Nonetheless, as always happens, when Lear stumbles on stage bearing the limp body of the faithful Cordelia and wails some of Shakespeare’s saddest, most nihilistic lines I could not help but wipe my eyes. It was, after all, a production that insisted we watched.